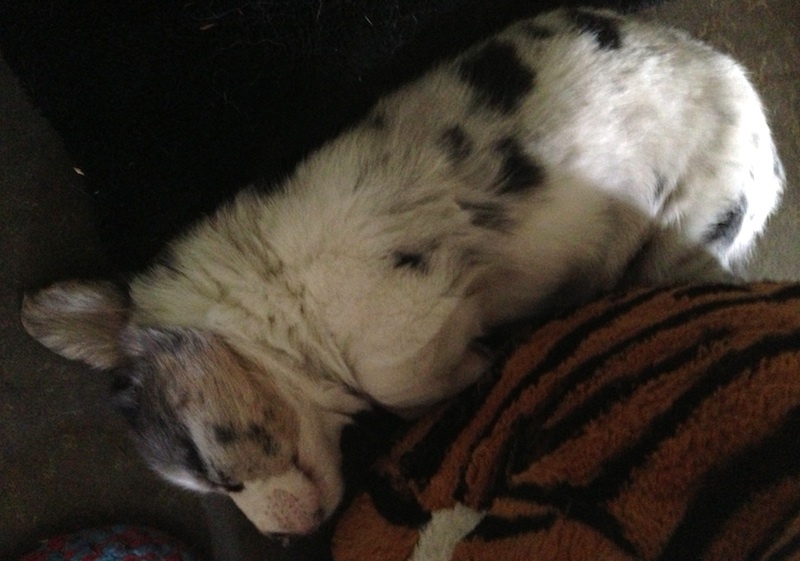 I've been bombarded with inquiries about Kitty's puppies, how they're doing, what they look like, etc., etc. Since I spent about four hours puppy-sitting yesterday, it was a prime opportunity to observe their activities, which consisted of play, sleep, eat, repeat. By the way, the sound in the background is a radio station. Kim Shira, the owner of Coedwig Cardigans, believes it's important to acclimate puppies to normal household sounds from the time they're very young. To that end she has a radio playing occasionally, as well as tapes that feature sirens, thunderstorms, traffic and other outside noises so they won't tend to be as reactive later. You've got to admire someone who loves the breed as much as she does, and who's as conscientious as she is about how they're brought up.